Leo H. Suing was born circa 1918 at Nebraska. He was the son of Clemens Suing and Mary Uhing. Marvin E. Wiebelhaus was born on 9 January 1929. He was the son of Anthony Alphons Wiebelhaus and Gertrude A. Marx. 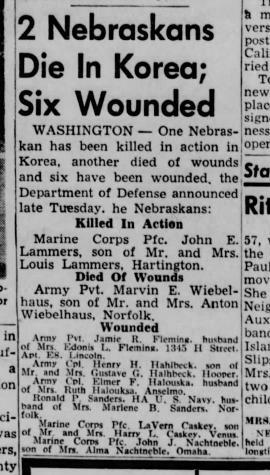 Marvin E. Wiebelhaus died on 13 August 1952 at age 23 Died of Wounds inflicted in Korea - Army Pvt. Marvin E. Wiebelhaus, son of Mr and Mrs Anton Wiebelhaus, Norfolk. Name Variation Wilhelmina Homkomp was also known as Minna. Married Name circa 1882 As of circa 1882,her married name was Wiebelhaus. Wilhelmina Homkomp was born in June 1862 at Germany. She was the daughter of Joseph F. Homkomp and Agnes (?). Wilhelmina Homkomp married Herman Wiebelhaus Jr., son of Herman Wiebelhaus and Mary Anna Stappert, circa 1882. Wilhelmina Homkomp died after April 1930. Wilhelmina Homkomp had 10 with 10 living in 1900 children. Children of Wilhelmina Homkomp and Herman Wiebelhaus Jr.
[S250] U.S. Federal Census 1930 U.S. Federal Census, by Ancestry.com, ED5. Dwelling 67. Name Variation Joseph F. Homkomp was also known as Hankoomk. Joseph F. Homkomp was born in December 1832 at Germany. He married Agnes (?) circa 1858. Joseph F. Homkomp died after 1910. Married Name circa 1858 As of circa 1858,her married name was Homkomp. Agnes (?) was born in August 1822 at Germany. She married Joseph F. Homkomp circa 1858. Agnes (?) died before 1910. Agnes (?) had 2 with 1 living in 1900 children. Name Variation Louis Joseph Wiebelhaus was also known as Lewis. Louis Joseph Wiebelhaus was born on 17 June 1889 at Nebraska also reported as Jun 1888. He was the son of Herman Wiebelhaus Jr. and Wilhelmina Homkomp. Louis Joseph Wiebelhaus married Susie (?) circa 1914. Name Variation John Edward Wiebelhaus was also known as Edward John. Name Variation John Edward Wiebelhaus was also known as Eddie. John Edward Wiebelhaus was born in August 1890 at Nebraska. John Edward Wiebelhaus married Cecelia E. (?) circa 1913. Married Name Her married name was Reiners. Name Variation Anna M. Wiebelhaus was also known as Annie. Anna M. Wiebelhaus married Bill Reiners. Anna M. Wiebelhaus was born in March 1892 at Nebraska. She was the daughter of Herman Wiebelhaus Jr. and Wilhelmina Homkomp. Name Variation William Henry Wiebelhaus was also known as Willie. William Henry Wiebelhaus was born on 21 January 1894 at Nebraska. William Henry Wiebelhaus married unknown (?) before June 1917. Joseph Herman Wiebelhaus was born on 9 May 1896 at Nebraska. On 5 June 1917 at World War I Draft Registration, Cedar, Nebraska, listed as Wiebelhouse. Albert Ferdinand Wiebelhaus was born on 2 February 1900 at Nebraska. Albert Ferdinand Wiebelhaus married Kathryn M. (?) before 1928. On 12 September 1918 at World War I Draft Registration, Cedar, Nebraska, listed as Wiebelhouse. Married Name 30 September 1921 As of 30 September 1921,her married name was Lammers. Rosina S. Wiebelhaus was born on 10 March 1902 at Nebraska. Rosina S. Wiebelhaus married Fred A. Lammers, son of John W. Lammers and Anna Kremer, on 30 September 1921. Rosina S. Wiebelhaus died on 17 August 1983 at age 81. Arthur F. Wiebelhaus was born circa 1905 at Nebraska. Arthur F. Wiebelhaus married Erna (?) circa 1928. Married Name before 1918 As of before 1918,her married name was Wiebelhaus. Johanna (?) married Joseph Frank Wiebelhaus, son of Herman Wiebelhaus and Anna Maria Peitz, before 1918. Married Name circa 1914 As of circa 1914,her married name was Wiebelhaus. Susie (?) was born circa 1889 at Nebraska. She married Louis Joseph Wiebelhaus, son of Herman Wiebelhaus Jr. and Wilhelmina Homkomp, circa 1914. Married Name before June 1917 As of before June 1917,her married name was Wiebelhaus. Unknown (?) married William Henry Wiebelhaus, son of Herman Wiebelhaus Jr. and Wilhelmina Homkomp, before June 1917. Married Name 18 November 1902 As of 18 November 1902,her married name was Albers. Emma Mary Wiebelhaus was born on 8 February 1883 at Nebraska also reported as 08 Feb 1887. Emma Mary Wiebelhaus married John W. Albers on 18 November 1902. Schaefer of Burke, S.D., Louise Ertz of Butte, Leon Suing of Gregory, S.D., Mrs. Clarence Erickson of Winner, S.D., Mrs. William Reiners and son of Wayne, and Mrs. Ferdinand Wiebelhaus of Fairfax, S.D. [S250] U.S. Federal Census 1930 U.S. Federal Census, by Ancestry.com, Year: 1930; Census Place: Precinct 4, Cedar, Nebraska; Roll: 1268; Page: 5B; Enumeration District: 5; Image: 438.0. Josephine Wiebelhaus was born in March 1884 at Nebraska. Josephine Wiebelhaus died before October 1950. Francis Wiebelhaus was born in May 1886 at Nebraska. Francis Wiebelhaus died before October 1950. Married Name before 1928 As of before 1928,her married name was Wiebelhaus. Kathryn M. (?) was born circa 1903. She married Albert Ferdinand Wiebelhaus, son of Herman Wiebelhaus Jr. and Wilhelmina Homkomp, before 1928. Married Name circa 1913 As of circa 1913,her married name was Wiebelhaus. Cecelia E. (?) was born circa 1888. She married John Edward Wiebelhaus, son of Herman Wiebelhaus Jr. and Wilhelmina Homkomp, circa 1913. Name Variation Fred A. Lammers was also known as Fridolin J. Name Variation Fred A. Lammers was also known as Fredolin. Name Variation Fred A. Lammers was also known as Freddie. Fred A. Lammers was born on 14 June 1901 at Nebraska. He was the son of John W. Lammers and Anna Kremer. Fred A. Lammers married Rosina S. Wiebelhaus, daughter of Herman Wiebelhaus Jr. and Wilhelmina Homkomp, on 30 September 1921. Fred A. Lammers died on 17 February 1981 at age 79. Name Variation Anna Willenbring was also known as Annie. Married Name 12 June 1894 As of 12 June 1894,her married name was Lammers. Anna Willenbring was born in June 1869 at Nebraska. She married Frank Lammers, son of John Lammers and Mary Stratman, on 12 June 1894. Anna Willenbring died in 1957. Barney Lammers was born in March 1895 at Nebraska. He was the son of Frank Lammers and Anna Willenbring. Margaret Lammers was born on 30 September 1896 at Nebraska. She was the daughter of Frank Lammers and Anna Willenbring. Margaret Lammers died on 29 October 1993 at age 97. Name Variation Helen Lammers was also known as Lena. Helen Lammers was born in October 1898 at Nebraska. Elizabeth Lammers was born circa 1903 at Nebraska. Roman Lammers was born on 20 March 1905 at Nebraska. Roman Lammers died on 3 September 1927 at age 22. Ludwig Anthony Lammers was born circa 1908 at Nebraska. Anton Olson Ness was born on 23 December 1876 at Norway. He was the son of Ole Jakobson Ness and Martha Olson. Anton Olson Ness married Karen Amalia Nordrum on 9 November 1901. Anton Olson Ness married Randi Marie Grina in 1904 at North Dakota. Anton Olson Ness died on 20 March 1952 at North Dakota at age 75. 28 May 1885 Tanberg, Wilkin, Minnesota Anton Olson Ness appeared on the census of 28 May 1885 in the household of Ole Jakobson Ness at Tanberg, Wilkin, Minnesota. 18 June 1895 Tanberg, Wilkin, Minnesota Anton Olson Ness appeared on the census of 18 June 1895 in the household of Ole Jakobson Ness at Tanberg, Wilkin, Minnesota. Anton Olson Ness immigrated in 1882 also reported as 1877. On 12 September 1918 at World War I Draft Registration, Burke, North Dakota. [S245] U.S. Federal Census 1900 U.S. Federal Census, by Ancestry.com, Year: 1900; Census Place: Tanberg, Wilkin, Minnesota; Roll: T623_796; Page: 5A; Enumeration District: 292.